The Lord blessed Scott and Lori Ann Richardson with the birth of Palmer Megan on October 8, 1992. 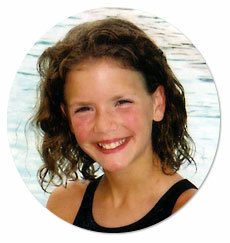 She was baptized into the Lord's family on April 25, 2003. Palmer has one sister, Hayden and two brothers, Baker and Sutton. This 12-year-old has a wide range of interests, including ballet, competitive swimming and fashion design. She is a member of the Western Arkansas Ballet Company. In their 2004 presentation of The Nutcracker, she performed as an Arabian Girl, Raggedy Ann and a Winter Sprite. In competitive swimming, she placed third in the 2004 Arkansas 50 meter freestyle event. Her special interests are just as wide-ranging: working with little children, babysitting, short film/movie productions, and AWANA Club. Her favorite Christian music performers are ZOEgirl, Out of Eden, and Rachel Lampa. Her favorite colors are as sparkly as her personality – pink, lime green, purple and white.